In addition to the master code, you can program up to 16 additional user access codes. If wireless keys have been programmed then wireless key #1 will log as User Access Code #1 (if that access code has been programmed). User Access Codes 1-16 will correspond to wireless keys or prox tags 1-16. Press [*][Master Access Code]; the armed indicator will turn on. Enter the 2-digit number to be programmed (e.g., 06 for User Access Code 6; enter 40 for the master access code) or press the scroll [<][>] buttons to find the specific code and press [*] to select. Enter the new 4-digit access code. When programming is complete, enter another 2-digit code to program or press [#] to exit. The access codes have programmable attributes which allow zone bypassing, duress, supervisor, or one-time use activation. On WT5500P keypads, you will be prompted to swipe a prox tag once the last character of theaccess code is entered. To delete prox tags, the associated user access code must be deletedas described, then re-programmed if required. The [*] User’s Programming command is used to program additional access codes. User Codes – User codes 1-16 are available for the system. Master Code (Access Code 40)- The master code has all of the attributes listed in the Programmable Attributes list below except for Duress (2) and One-Time Use (8) and is required to program all supervisor code attributes. Supervisor Codes – These codes are always valid when entering the User Code Programming or User Function sections. However, these codes can only program additional codes which have equal or lesser attributes. Once programmed, the supervisor codes receive the master code’s attributes. These attributes are changeable. Any user code can be made a supervisor code by enabling User Code Attribute 1 (please see below for details). Duress Codes – Duress codes are standard user codes that will transmit the Duress Alarm Reporting Code whenever the code is entered to perform any function on the system. Any usercode can be made a duress code by enabling User Code Attribute 2 (see below for details). One-Time Use Code – This code permits temporary access to the system for a 24-hour timeperiod. During the 24hr period, the temporary user may disarm the system once. There is no restriction on the number of times the temporary user may arm the system during the time period. NOTE: Duress codes are not valid when entering [*], [*] or [*] sections. NOTE: Access codes cannot be programmed as a duplicate or as a ’Code +/- 1’. The default attributes of a new code will be the attributes of the code used to enter [*]whether it is a new code or an existing code being programmed. System Master (Code 40) has Attribute 3 on by default. Arm / Disarm – Any access code will be valid for arming and disarming the system. Command Outputs ( and ) – If these outputs require access code entry, anyaccess code is valid for performing the [1-2][Access Code] functions on the system. This attribute allows the user to manually bypass zones if bypassing requires an access code. This attribute is used to determine whether an access code should generate an arming/disarming squawk when the away function key is pressed on a wireless key fob. Contact your installer to have this programmed. The Master code cannot use the Bell/Siren Squawk attribute, but the code is required to enable the Bell/Siren for other codes. NOTE: This feature cannot prevent the Arm/Disarming squawks from being generated if an access code assigned to a wireless key is manually entered at a keypad. To erase a code, select the code and enter [*] as the first digit. If [*] is entered, the system will delete the code (including the associated prox tag) immediately and the user will be returned to select another code. Stay arming will bypass the interior protection (i.e., motion sensors) and arm the perimeter of the system (i.e., doors and windows). Close all sensors(i.e.,stop motion and close doors). The Ready (✔) indicator will illuminate. Press and hold the Stay (MAN IN HOUSE) button until it beeps (approx. 2 seconds), enter your access code or present your prox tag; do not leave the premises. During the setting state (exit delay active),the Armed (PADLOCK ICON) and Ready (✔) indicators will illuminate. When the exit delay is completed, the alarm system is armed/set and this is indicated on the keypad as follows: the Ready (✔) indicator will turn off, the Armed (PADLOCK ICON) indicator will remain on. The Armed indicator and a bypass message will be displayed. The system will automatically ignore bypassed zones (i.e., motion sensors). NOTE:For SIA CP-01 listed panels, the Stay Arming Exit Delay will be twice as long as the Away Arming Exit Delay. NOTE: If your system is installed in accordance with SIA CP-01 Standard for False Alarm Reduction, then the security system will arm in the Stay Armed mode if the exit delay time expires and no exit has been made. To night arm the system when it has been armed in Stay Mode, press [*]  at the keypad. All interior zones will now be armed except for devices programmed as Night Zones. NOTE:Your installer can also program a function key on the keypad to allow you to arm the system in Night Mode. This allows Night Arming to be activated by holding down the function key for 2 seconds. Night zones are only armed in Away mode; this permits limited movement within the premiseswhen the system is fully armed. Ensure that your installer has provided you with a list identifying zones programmed as night zones. When the interior zones are activated (i.e., [*] ) you must enter your access code or present your proximity tag to disarm the system in order to gain access to interior areas that have not been programmed as night zones. If the system is armed using the Stay button or using the ’No Entry’ Arming method ([*][Access Code]), the keypad buzzer will be silenced and the exit time will be doubled for that exit period only. Close all sensors (i.e., stop motion and close doors). The Ready (✔) indicator should be on. To arm, press and hold the Away button for 2 seconds and/or enter your access code, present your prox tag or press [*] to Quick Arm. During the setting state (exit delay active) the Armed and Ready (✔) indicators will turn on,and the keypad will sound one beep per second. You now have ___ seconds to leave the premises (please check with your installer to have this time programmed). A keypad buzzer, whose pulsating rate is distinct, will sound during the last ten seconds of the exit delay to warn person(s) that the exit delay is running out. To cancel the arming sequence, enter your access code or present your prox tag. When the exit delay is completed, the alarm system is armed and this is indicated on the keypad display as follows: the Ready(✔) indicator will turn off, the Armed indicator will remain on and the keypad will stop sounding. The system can also be armed/disarmed with a wireless key and with prox tags. Refer to the‘Proximity Tags and ‘Two-Way Wireless Key’ sections for more details. NOTE: If your system is installed in accordance with SIA CP-01 Standard for False AlarmReduction, the following holds true:\ Violation and restoral, followed by a second violation of the entry/exit zone before the end of the exit delay, will restart the exit delay. If the system is armed and you need to exit, use the Quick Exit function to avoid disarming and rearming the system. Press and hold the Quick Exit button (OPEN DOOR ICON) for 2 seconds or press [*] . You now have 2 minutes to leave the premises. When the door is closed again, the remaining exit time is cancelled. Enter your access code or present your prox tag, before the entry delay timer expires, to dis-arm the system. Repeat the Away arming procedure, ensuring that the entry/exit door(s) are secured. An error tone will sound if the system is unable to arm. This will happen if the system is not ready to arm (i.e., sensors are open), or if an incorrect user code has been entered. If this happens, ensure all sensors are secure, press [#] and try again. To disarm an armed system (Armed indicator is On), enter your access code or present your prox tag. If your keypad is in sleep mode, press any key to wake it up then enter your access code/present prox tag. The keypad will sound a continuous tone after the entry delay has been initiated by opening the entry/exit door. Enter your code within _______ seconds to avoid analarm condition (check with your installer to have this time programmed). If your code/prox tag is invalid, the system will not disarm and a 2-second error tone will sound.If this happens, press [#] and try again. The system can be armed and/or disarmed, if programmed by the installer, using a remote control device (wireless key fob). 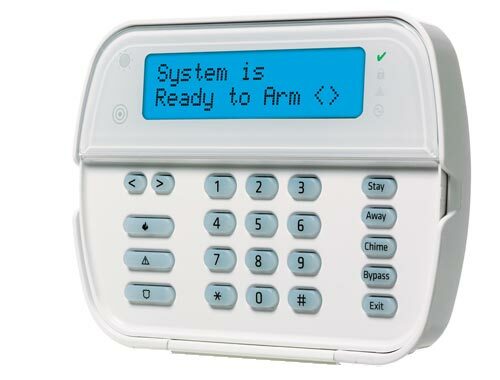 When arming the system using the Arm button on a wireless key, the system will acknowledge the command by sounding a single bell/siren squawk, if programmed to do so by the installer. When disarming using the disarm button on a wireless key, the system will acknowledge the command by sounding two bell/siren squawks. Three squawks, when disarming with the disarm button, indicates that an alarm occurred while the system was armed. If you are unsure of the cause of the alarm, proceed with caution (see section on 2-way Wireless Keys). Use the zone bypassing feature when you need access to a protected area while the system isarmed, or when a zone is temporarily out of service but you need to arm the system. Bypassed zones will not be able to sound an alarm. As a result, bypassing zones reduces the level of security. If you are bypassing a zone because it is not working, call a service technician immediately so that the problem can be resolved and your system returned to proper working order. Ensure that no zones are unintentionally bypassed when arming your system. Zones cannot be bypassed once the system is armed. Bypassed zones (except for 24-hr zones) are automatically cancelled each time the system is disarmed and must be bypassed again, if required, before the next arming. Press [*] to enter the function menu. If your system is programmed to require access codes the screen on the right will be displayed. Enter your 4-digit access code. Scroll to the desired zone number using the [<][>] keys, then press [*] to select the zone or directly enter the 2-digit number of the zone you wish to bypass (e.g., 0 5 for zone 5). Press [*], then your access code or present your prox tag if required. To exit bypassing mode and return to the Ready state, press [#]. A Bypass Group is a selection of zones programmed into the system. If you bypass a group of zones on a regular basis, you can program them into a Bypass Group, so that you do not have to bypass each zone individually. Note that only one Bypass Group can be programmed at a time. Enter the 2-digit numbers (01-34) of the zones to be included in the Bypass Group or use the [<][>] buttons to find the zone to be included in the Bypass Group, then press [*] to select the zone. To save the selected zone into the group, press . NOTE:If an access code is required to enter bypassing, only the master code and codes with Supervisory enabled can set the Bypass Group. Press [*], then your access code or present your prox tag (if necessary). Press . The next time the system is armed, the zones in this group will be bypassed. NOTE: A Bypass Group is only recalled if the system is armed/disarmed after programming the Bypass Group. NOTE: This feature is not to be used in UL Listed installations. When an alarm occurs, the Alarm Memory message will be displayed. To view which sensor(s)generated the alarm, press [*]. For the system keypad use the scroll [<][>] buttons to view the sensors in alarm memory. Press [#] to exit. To clear the memory, arm and disarm the system. If an alarm sounded while armed,the system will automatically go to alarm memory when you disarm the system. In this instance,you should proceed with caution, as the intruder may still be within the building/premises. To turn the door chime function on or off, press and hold the Chime (BELL ICON) button for 2 seconds or press [*]. The system will sound 3 beeps to indicate the door chime is on, or one long tone to indicate that door chime is off. Press the Fire[FIRE BUTTON], Auxiliary[TRIANGLE WITH !] or Panic [POLICE BADGE] button for 2 seconds to generate a Fire, Auxiliary, or Panic alarm. The keypad buzzer will beep indicating that the alarm input has been accepted and transmission to the central station is underway. The Panic button may or may not sound the siren depending on installer setup. NOTE: The Fire button can be disabled by the installer. NOTE: The Auxiliary Alarm button is not intended to be used for medical signals. Time and Date – Enter 4 digits for 24hr System Time (HH-MM). Valid entries are 00-23 for the hour and 00-59 for minutes. Enter 6 digits for the Month, Day and Year (MM-DD-YY). System Test – The system’s Siren Output – 4 seconds (2 seconds medium volume, 2 seconds high volume), keypad lights, back-up battery pack and communicator are tested. Enable DLS / Allow Remote System Service – If enabled, the installer will be able to access Installer Programming remotely using DLS (Downloading Software). This function provides a window for telephone ring detection by the alarm system. The DLS window will remain open for 6hours, during which time the installer will be able to enter DLS an unlimited number of times. After the 6-hr window has expired, access to programming via DLS will be unavailable until the window is re-opened. User Call-up – If enabled by the installer, the panel will make 1 attempt to call the downloading computer. The downloading computer must be waiting for the panel to call before downloading can be performed. User Walk Test – Allows the user to enter the Walk Test mode. Late to Open Enable/Disable – This function enables or disables the Late to Open time programmed in . Late to Open Time of Day – This function is used to program the time setting enabled in . NOTE: Refer to ‘Late to Open’ section for details. When this option is selected, the keypad will allow you to scroll through 4 brightness levels and 10 contrast levels. Use the [<][>] buttons to scroll to either Brightness Control or Contrast Control. Press [*] to select the setting you want to adjust. a) Brightness Control: There are 4 backlighting levels. Use the [<][>] buttons to scroll to the desired level. b) Contrast Control: There are 10 different display contrast levels. Use the [<][>] buttons to scroll to the desired contrast level. When this option is selected, the keypad will allow you to scroll through 21 different buzzer levels. A level of 00 disables the buzzer. Use the [<][>] buttons to scroll to Buzzer Control, then press [*] to select. There are 21 levels; use the [<][>] buttons to scroll to the desired level. Press [#] to exit. The event buffer will show you a list of the last 500 events that have occurred on your system. To select Event Buffer viewing, press [*]. The keypad will display the event number and the time and date. Press [*] to switch between this information and the event details. Use the [<][>] buttons to scroll through the events in the buffer. To exit event buffer viewing, press [#]. On a fire alarm, the bell or siren will pulse ON and OFF. The transmission of the alarm to the central station is delayed for 30 seconds. If the alarm is not cleared within the 30 second delay, it will then be transmitted to the central station. To silence the bell or siren, press the [#] key. If the alarm is silenced and the smoke detector is not reset, the alarm will resound after 90 seconds. Once the smoke detector is reset, if it still detects smoke, the alarm sequence will resound as described above. If there is no smoke, the system will return to normal. NOTE: The description above may not be applicable depending on how your installer has programmed the fire alarm operations on your system. Ask your installer for more information regarding your system’s operation. Press [*] then your master access code to enter User Functions. Use the [<][>] buttons to find the menu option,then press [*] to select. Enter the time in 24-hr. format(HH:MM), followed by the date (MM:DD:YY). Press [#] to exit programming. If you are viewing a ‘Loss of Clock’ trouble from within the trouble menu ([*]),press [*] to directly enter Date and Time programming (see Trouble Conditions). NOTE: Your installer may have programmed your system to display the time and date while the keypad is idle. Press the [#] button to temporarily clear the date and time display if desired. NOTE: Inform your Monitoring Station when you begin and end system testing. All smoke detectors in this installation must be tested by your smoke detector installer or dealer once a year to ensure they are functioning correctly. It is the user’s responsibility to test the system weekly (excluding smoke detectors). Ensure you follow all the steps in the two tests below. NOTE: Should the system fail to function properly, call your installer immediately for service. This test activates all display pixels and indicator lights on the keypad and does a 4-secondcheck of the siren. Press [*][Master Code].The following will occur:- The system activates the siren output on medium volume for 2 seconds followed by full volume alarm for 2 seconds. All display lights and LCD pixels will turn on. – The Ready, Armed, Trouble and Power LED’s will flash for the duration of the test. To exit the function menu, press [#]. The flashing trouble icon (TRIANGLE) on a keypad will indi-cate that keypad has a low battery. Slide the keypad up and out from the mounting plate/desk stand (removing the screws first if required). The bay for the four AA batteries is open and visible at the back of the keypad. Insert the batteries as directed on the back of the keypad. Ensure the correct polarity is observed. Slide the keypad back onto the mounting plate / desk stand. To determine which siren has a low battery press and hold the test button, located at the front of the siren, for 5 seconds. If the siren sounds for 4 seconds, the batteries are good. If the siren doesn’t sound, the batteries are low. Open the front cover and remove old batteries. Once the old batteries are removed, wait 30 seconds before inserting the replacement batteries. Note: Only use Energizer 1.5V AA alkaline batteries. Install new batteries as shown in the polarity indicated by the engraving. If the batteries are installed incorrectly, in the reverse polarity, the indoor siren will not work. With typical use, the WT4901/WT8901 batteries should be replaced every two years. DO NOT TRY TO RECHARGE THESE BATTERIES. DISPOSAL OF USED BATTERIES MUST BE MADE IN ACCORDANCE WITH THE WASTE RECOVERY AND RECYCLING REGULATIONS IN YOUR AREA. Walk Test mode allows you to test the operation of each detector in the system. While in Walk Test mode, the Ready, Armed, and Trouble LED’s will flash to indicate that the Walk Test is active. TheWalk Test can be terminated at anytime by re-entering [*][Master Code] on the keypad. The system will also automatically terminate the Walk Test on completion; it will sound an audible warning (5 beeps every 10 seconds), beginning 5 minutes before the termination of the test. Before testing, ensure that the system is disarmed and the Ready light is on. Press [#] and close all zones to return the system to the Ready state. Perform a System Test by following the steps in the previous section. Press [*][Master Code] to initiate the Walk Test. To test the zones, activate each detector in turn (e.g., open each door/window or walk in motion detector areas). The System will display the following message when each zone (detector) is activated: ‘Secure System Before Arming < >’, or ‘Secure or Arm System’. Use the [<][>] buttons to view which zones are open. The message will disappear when the zones are closed. When a trouble condition is detected, the Trouble (TRIANGLE) indicator will turn on and the keypad will beep every 10 seconds. Press the [#] button to silence the beeps. Press [*] to view the trouble condition. The Trouble indicator will flash. Use the scroll [<][>] keys to view troubles. Alternate Communicator Trouble Indicates SIM Card Lock, GSM Trouble, Ethernet Trouble, Central Station Receiver Trouble, Supervision Trouble, and SMS Config Trouble. Press [<][>] to scroll through individual troubles. Call for service. For Ethernet Trouble check LAN connections. Service Required (Press  for more information) Indicates Low Battery, System Trouble, System Tamper or RF Jam detected. Call for service. Loss of AC Power If the building and/or neighbourhood has lost electrical power, the system will continue to operate on battery power for several hours. Check AC connection.Call for service. Telephone Line Fault The system has detected that the telephone line is disconnected. Call for service. Failure to Communicate The system attempted to communicate with the monitoring station but failed. This may be due to a Telephone Line Fault. Call for service. Module/Sensor Fault The system is experiencing difficulties with one or more module/sensor on the system. Continue to press  to navigate through the Zone, Keypad, and Siren fault menus. Call for service. Module/Sensor Tamper The system has detected a tamper condition with one or more module/sensor on the system. Continue to press  to navigate through the zone, keypad, and siren tamper menus. Call for service. Module/Sensor Low Battery The system has detected a low battery condition with one or more module/sensor on the system. Continue to press  to display the zone(s), wireless key(s), keypad(s), siren(s) and prox tag(s). See section on Siren Test. Call for service. Loss of Time & Date If complete power was lost (AC and Battery), the time and date will need to be re-programmed. Press [*]. Reprogram Time & Date. “Panel Response Not Received” message The keypad has lost wireless communication with the panel. Occasional display of this message may be caused by local radio frequency interference. If trouble persists, call for service. When the Troubles Inhibit Arming feature is enabled, the Trouble Acknowledgement feature may be used to acknowledge and override the existing troubles, so the system can be armed. To use this feature, press [*] to enter the Trouble menu. Scroll [<][>] left or right and press [*] or when the keypad displays, “Trouble Acknowledgement.” An override event will also be logged, thus identifying the user. To override open, faulted or tampered zones use the Zone Bypass feature([*]). Enter the 2 Digit Zone Number for each respective zone you wish to bypass. Each 2 Digit Zone Number is one entry, repeat this process if you are bypassing more than one zone. E.g. [*] +  THEN  will bypass zone 5. Any additional entries will bypass other zones. Enter [*] +  to manually view the alarm memory. Press the and arrow keys to navigate through alarm memory. Alarm memory will automatically display each time the system is disarmed.